Bath time can be a wonderful, loving experience for both you and your baby. Here is some advice for approaching the task with common sense and confidence. As long as you clean your baby’s diaper area well after each bowel movement, washing every two or three days is plenty. You may want to spot-clean daily in areas that get particularly sweaty, oily or dirty: the diaper area, face, neck and skin creases. A sponge bath is often the recommended way to cleanse your newborn’s skin until the cord falls off. To give a sponge bath, find a bathing surface that is the right height for you, such as the kitchen counter. Line up all your supplies beforehand so you don’t have to leave the baby unattended. To avoid giving your baby a chill, keep them covered as much as possible. Wash their top half first, keeping their other half wrapped in a towel. Then wash their bottom half, while keeping their top half covered. Begin by washing your newborn baby’s face with plain water, especially behind his ears and under his chin. Wash your baby’s chest, arms and hands, making sure to cleanse thoroughly between his fingers. 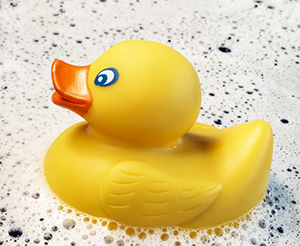 If you use a mild soap and cotton ball or washcloth, rinse immediately to avoid drying or irritating the area. Wash your baby’s back. With a washcloth or towel, gently pat dry the upper half of his body. Vigorous rubbing could irritate your baby’s skin. Wash your baby’s genital area from front to back, then the legs and feet, especially between the toes. Gently pat dry his lower body. To wash your baby’s hair, squeeze a bit of water on top of his head with a washcloth. Apply a dab of baby shampoo (a no-tears formula) and gently massage the scalp. Don’t worry about the soft spot; it is actually tough underneath, and you can do no harm as long as you’re gentle. Remove all traces of the shampoo with a washcloth dipped in warm water. When you’re finished, dry your baby thoroughly with a towel and put on a fresh diaper and clean clothes. Some healthcare professionals suggest you wait until the umbilical cord has fallen off and the circumcision site has healed (if you have a circumcised son) to give your baby a tub bath. Fill a plastic baby tub with two to three inches of water, and then place it at a convenient height. Never leave your baby unattended in the bath. You can also put the tub inside the sink or wash your baby in the sink without a tub. Just line the bottom of the sink with a folded towel to keep your baby from slipping, and turn the faucet away from your baby. Before you start, gather everything you’ll need and be sure the water is neither too hot nor too cold. To test the water, use your elbow or the inner side of your wrist. Try singing songs and playing while you wash your baby. This will help make bath time fun and special for both of you.